Some of the links in this post may be from our partners. We only work with companies we trust and recommend. Learn how we make money. 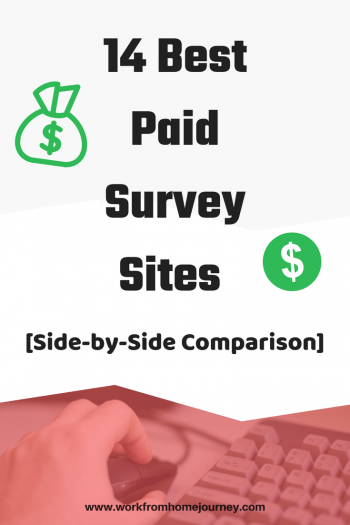 Paid survey sites are a great way to supplement your income. Many people make $100’s each month just from surveys! The problem is, there are so many survey sites out there, it can be difficult deciding which ones are the best. Well, now there’s no need to keep looking. 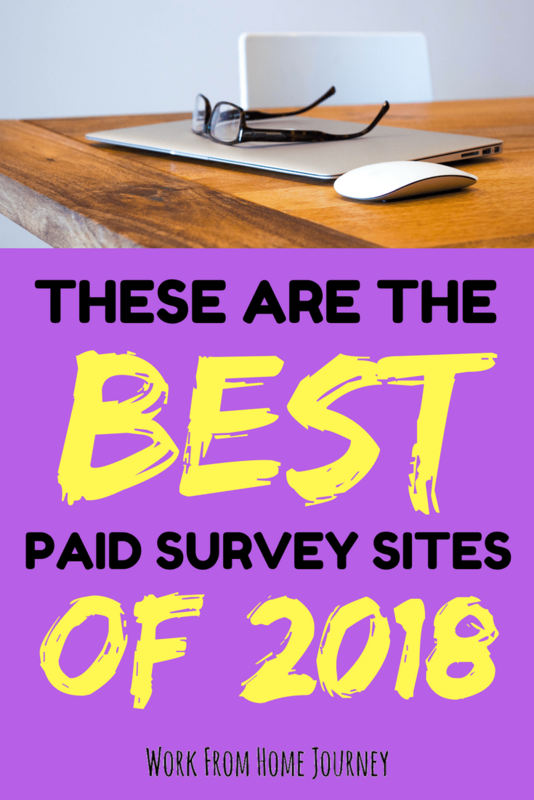 In this post, I’ve compiled the best paid survey sites of 2019 – all of them are legitimate, established, and paying real money. In fact, I’ve even created a handy comparison chart (it’s sortable!) so you can find exactly what you’re looking for. PRO TIP: Try them all out in order to maximize your earnings. Swagbucks is a great site to join if you’re looking to earn some free money. That’s because you can get paid for doing a whole bunch of different things, not just surveys. Swagbucks is known as a GPT site (GPT stands for “Get Paid To”), and is probably the most popular GPT site. They’ve been around since 2008, and since then have paid out more than $280,000,000 to their members! Actually, all of the sites on this list are free. PRO TIP: If a survey site ever charges money to join it, stay away. As a Swagbucks member, you’ll get paid in “SB”. One SB is worth $0.01. You can redeem your earnings for a variety of gift cards (starting at $3), and once you have $25, you can cash it out straight to PayPal. Swagbucks won’t make you rich, but it can be a good side-income. 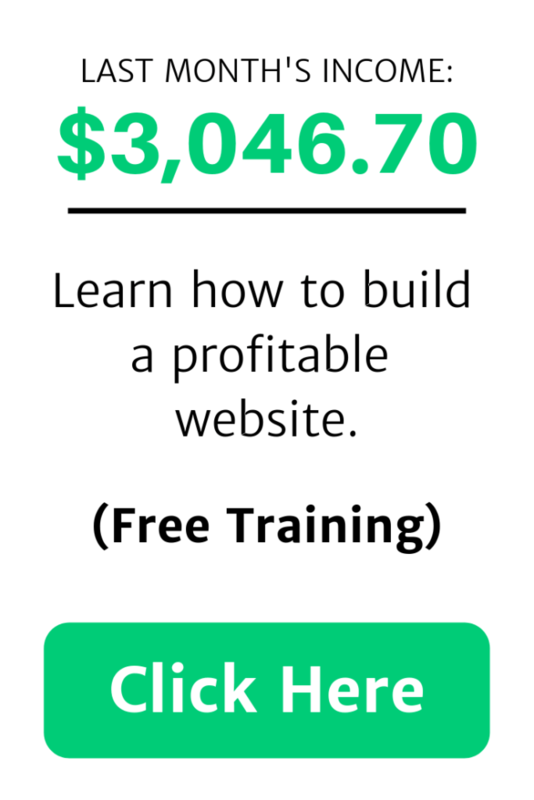 If you use it regularly, earning $50-$100/month won’t be too difficult. Some people have reported earning $10+/day! Looking for a more thorough overview of Swagbucks? I wrote a detailed review of it which you can check out here. In short, I highly recommend Swagbucks. It’s been around for a long time, and I’ve never had any issues with it. PineCone Research is an exclusive survey site owned by Nielsen, a large market research company. It was founded in 1998 and is considered one of the best survey sites out there. PineCone Research is “exclusive” because not just anyone can join. It’s invite only. That means you have to find a working link if you want to join. But no need to scour the web. If you join through my link, you should be good to go! Unlike Swagbucks, PineCone Research is not technically a GPT site. They only offer surveys and sometimes product testing, so the earning opportunities are limited. However, PineCone Research is one of the best-paying survey sites. The minimum you can earn for completing a survey is $3! Conveniently, that’s also the minimum amount required to cash out. The first $3 you earn will be sent to you via check, but after that you can choose from a number of different redemption options. These include PayPal, various gift cards, prepaid Visa cards, movie vouchers, merchandise, and sweepstakes entries. Besides surveys, PineCone Research also occasionally wants people to test out physical products. Of course, you’ll get paid for this – and if you’re lucky, you’ll get to keep the product! Survey Junkie is considered by many to be one of the best survey sites. It’s been around since 2005, and has over 7,000,000 members! Survey Junkie pays it’s members in points. Each point is worth $0.01 (one cent). Surveys generally pay out anywhere from 25 points to several hundred points. You can redeem your points for cash or gift cards once you’ve reached $10. I’ll warn you, it will take a little while before you reach this threshold. The pay isn’t great, but it’s pretty easy to earn and doesn’t require actual “work”. Also, just so you’re aware…you might disqualify for some of the surveys you attempt (true with almost every site in this list). This is because most surveys are looking for a specific demographic, and if yours doesn’t fit the criteria, you’ll be kicked out. But at least you won’t be left with nothing. Survey Junkie compensates users with 2 points every time they disqualify from a survey. YouGov is one of the few survey panels that’s available in most parts of the world. And despite it’s large global presence, it actually pays out very well compared to a lot of survey sites. As a member of YouGov, you can expect to receive several emails a week notifying you of a new survey. One of the great things about YouGov is that you’ll rarely ever disqualify from a survey, and if you do, you’ll be redirected to one that you do qualify for. YouGov rewards its members in points. Once you reach 25,000 points, you can redeem them for $15. Depending on which country you are from, you can redeem your points for gift cards, cash via PayPal, a prepaid Visa, bank transfer, merchandise, movie vouchers, or sweepstakes entries. You can also donate your earnings to charity. A neat thing about YouGov is that you can see the results of different surveys you took quoted in national and international stories. Most survey panels don’t share this information publicly. Global Test Market is a survey and product testing website founded in 1999. In 2016 alone, they paid out more than $30 million to their millions of members from around the world. Global Test Market is one of the few “global” survey sites. 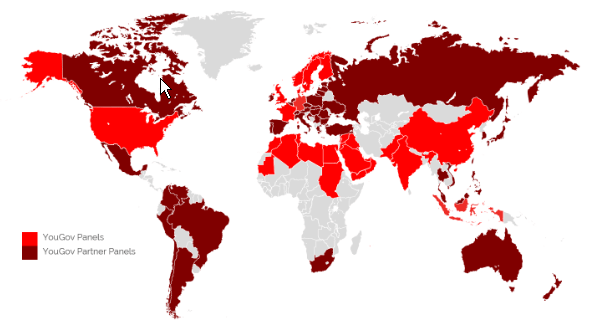 They operate in a number of different countries – some sites saying as many as 200, others saying less than 50. I’ve not yet found a definitive answer, so you’ll have to just try joining and see if it works! Unlike many survey sites, you don’t have to be 18 to join Global Test Market. The minimum age is 14! Once the payout threshold is reached, members can redeem their points for PayPal cash, check, gift cards, sweepstakes entries, or vouchers. A charity donation is another option. E-Poll is a survey panel owned by Bridge Entertainment, Inc.
E-Poll is different from other survey sites in that all of their surveys are related to the entertainment industry. So if you like watching TV shows and movies, E-Poll would be the perfect survey panel for you to join! Members are compensated in “points”. Once you reach 3750 points, you can redeem them for $5. You can choose from PayPal, a variety of gift cards, e-vouchers, or sweepstakes entries. You can also donate $5 to charity when you hit 2750 points. The more points you earn, the more they increase in value. For example, 7250 points = $10, 10,500 points = $20, 16,250 points = $25, and 18,750 points = $30. Unfortunately, E-Poll is only available to residents of the United States. On the other hand, they don’t require you to be 18 to join. You can join even if you are just 13! Qmee is a little bit different from most of the sites in this list. That’s because with Qmee, there are more ways to earn money than by simply doing surveys. You can also get paid for searching the web, and for referring your friends to Qmee. Qmee also uses a different rewards system than most other sites. Whereas most sites award their users in points, Qmee actually pays real cash to their users. And if that’s not enough, you can cash out your earnings at any time. Even if you’ve only earned a cent! So if you just need a little money in your PayPal account right now, Qmee would be a great option. You can join and start taking surveys and getting paid right away. You can redeem your earnings for PayPal cash, gift cards, or you can donate them to charity. If you want more information on Qmee, check out my detailed review! Harris Poll Online, a subsidiary of Harris Insights and Analytics, currently being operated by Nielsen, is one of the oldest market research companies. Harris Poll got its start back in 1963! Members of Harris Poll Online can get paid for answering surveys, participating in online (and in-person!) focus groups, and completing direct mail assignments. As with E-Poll, you only have to be 13+ years old in order to participate. Harris Poll rewards its users in “Hitpoints”, which can be redeemed once you’ve accumulated 1250 of them (worth $10). The only redemption options available are gift cards and merchandise, or you can also donate your earnings to charity. You also automatically get entered into their sweepstakes every time you disqualify from a survey or take a survey that doesn’t offer a reward. The sweepstakes have many awesome rewards, including a chance to win $10,000 every quarter! If you disqualify from a survey (it can happen a lot if you’re not the right demographic) you’ll still get 15 Hitpoints. It’s not much, but hey, it’s certainly better than nothing! OneOpinion is a survey site owned by Critical Mix, a market research company. OneOpinoin is considered by many to be among the best survey sites, in general offering more compensation per survey than most other sites. Depending on the length, most surveys pay anywhere from $1-$5. Some pay as much as $15! Most surveys take about 5-30 minutes to complete, so don’t quit your day job for this…. Besides surveys, members occasionally get the chance to test real products before they hit the market. Best of all, you get compensated for it! OneOpinion pays it’s members with “points”, which can be redeemed for cash into your PayPal account or a prepaid Visa card. The minimum payout threshold is $25, so that means you need to earn 25,000 points before cashing out. One great thing about OneOpinion is that they offer excellent customer support. If you’re familiar with survey companies, you’ll know this is extremely rare! Yet another great thing about OneOpinion is that multiple people from the same household can create accounts and start earning. Again, this is very uncommon among survey sites. As far as eligibility, you must be at least 13 years old to join, and either be from the United States, Canada, or the UK. If you’re in search of a survey site that’s available in every country and never disqualifies you from a survey, your search has ended. PaidViewPoint is probably one of the best survey sites on the planet. Just for signing up, you’ll get $1 for free. After that, you can complete a few “Trait Surveys” which don’t take long and award you between 3 and 10 cents each. And after that, you’ll have to wait until a survey becomes available. Trait Surveys are good for increasing your “TraitScore”. The higher your TraitScore, the more you can earn for each survey. If your TraitScore is over 9,000, you’ll be among the top 10% of users and will earn even more. One of the cool features of PaidViewPoint is that you can see exactly what you earn for each question in a regular survey. And another cool thing is that you’re not paid in “points”, you’re actually paid in real cash. But before you get too excited, you do have to accrue at least $15 before you can cash out. Once you reach that threshold though, you can redeem your hard earned cash directly to PayPal, or choose from a number of gift cards. The one major complaint with PaidViewPoint is that it takes a long time to reach $15. Most surveys pay less than a dollar in total, and the ones that pay more are snapped up pretty quickly. So in order to maximize your earnings, you may want to consider participating in PaidViewPoint’s referral program. As a member, you’ll get an “affiliate link”. You can share this link with your friends, and when they sign up, you’ll get 20% of what they earn for life, up to a total of $25. Not bad! And don’t worry, this does not affect your friends’ earnings. The referral bonus comes out of PaidViewPoint’s pocket. In order to join PaidViewPoint, you must be at least 13 years old. Otherwise, there doesn’t seem to be any restrictions such as which country you’re from. Fusion Cash is a “Get Paid To” website (much like Swagbucks) and has been around since 2005. Paid surveys are a big part of Fusion Cash’s platform, but as it’s a full GPT site, there are many other ways to earn money as well. That’s a lot of ways! Because there are so many opportunities, you won’t run out of ways to earn very easily. As far as surveys go, most of them pay out anywhere from 35 cents to $4 or more, depending on the length. Most surveys take 5-30 minutes to complete. If you disqualify from a survey, you’ll get a $0.01 consolation prize. I guess that’s better than nothing, right? If you are really active, you can actually earn quite a bit from Fusion Cash. Some members have earned thousands of dollars! However, as with any other GPT or survey site, you’ll earn less than minimum wage. But it’s still a decent way to earn a little side income during your downtime. You can cash out your earnings once you’ve reached $25. However, you first have to be approved which can take over a month. I wrote an in-depth review of Fusion Cash, so if you’re interested but want more information, please feel free to check it out. Vindale Research is one of the oldest survey panels and is available to residents of the United States, Australia, Great Britain and Brazil. Surveys generally pay out $1-$5, and last 5-30 minutes (with some exceptions of course). This is pretty standard for survey sites, but well below minimum wage (since you’ll disqualify from many surveys you attempt). Users may also get the chance to test different products, but are required to pay for them. However, Vindale Research reimburses the cost and pays out $5-$75 extra for your time and honest review. You can cash out your earnings to PayPal once you’ve reached $50. $50 is really high for these types of sites, so it could be a while before you can put your hard earned cash to use. However, when used in conjunction with a bunch of other paid survey sites, it’s a great website to use for supplementing your income. Tellwut is a rather…unique survey panel. As a member of Tellwut, you’ll be joining a community of over 500,000 people. Tellwut includes some basic social network functions; for example, you can private message other users. You can also create your own polls and surveys, and actually get paid for them! And if you really enjoy writing, you can contribute to Tellwut’s blog to earn even more. Tellwut compensates it’s users with a points-based system. 4,000 points is worth $10, and is the minimum required before you can cash out. Answering other user-created surveys will only earn you 5-15 points, but many users agree that the surveys are a lot of fun and they learn something new every day. There are also a lot more surveys available at any given time on Tellwut than there are on most other survey panels, so you don’t need to wait forever before you’re invited to take a survey as with some panels. Still, it will probably take a long while before you rack up enough to cash out. Once you’ve reached the minimum payout threshold of $10, you can choose to redeem your earnings for a prepaid Visa card, a variety of different gift cards and vouchers, or merchandise. Unfortunately, PayPal is not an option. Tellwut is available to residents of the United States and Canada who are at least 18 years old. Springboard America, a paid survey site, was launched in 2009 by Vision Critical. Just for joining, members are automatically entered into a $1,000 prize draw. By completing profiling surveys, special surveys, and more, members receive additional entries. For every survey they complete, members are paid in “Survey Dollars”. Survey Dollars are equal to USD. Most surveys pay out anywhere from $0.50-$5, depending on their length. Surveys generally last 20-30 minutes each. Make sure to do one survey at least every 3 months. If you’re inactive for more than 3 months, all of your earnings will be lost. Unfortunately, survey invitations are only sent out a few times per month on average. That means it could take quite a while to earn anything substantial. What’s worse, the payout threshold is $50. But once this threshold is reached, members can redeem their earnings through several different methods. “Paylution”, basically a bank transfer, is one option, another is a prepaid Visa card, and another is your choice from a variety of gift cards. Springboard America is available to US residents who are at least 14 years old. I hope you found this list helpful, and that you’ll try some (or all!) of these paid survey sites out. You won’t get rich filling out surveys, but like I’ve said, they are a great way to earn a little side income in your downtime. If what you’re looking for is a real work from home job (that actually pays a full-time income), surveys just aren’t going to work. You’d be much better off following my top recommendation. If you have any questions or comments, please don’t hesitate to leave a comment below! Pin if you liked this post!